There are a ton of huge decisions to make when planning a wedding. The dress, the cake, the venue...but the invitations are another biggie. They cost a lot, they set the mood for the wedding, and you'll have at least one as a keepsake forever. Today I'm going to share with y'all my top picks for wedding invitations and I'm going to attempt to cover all price ranges and different places you can purchase! While we didn't choose this option, I love the idea of incorporating your engagement pictures onto your wedding invite. These are $9 for 10 invitations, which are some of the least expensive that I have seen. I also like that you can order them in groups of 10. This is on a completely different end of the spectrum, at the more high end of $4.50 per invitation. 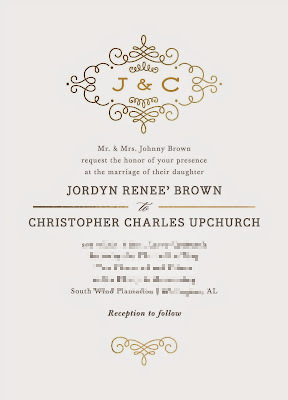 I love the heavy look of this invite and the rustic almost chalk-board background. I also love the border and the interesting shape! As you can tell by most of my posts, my wedding is going to be very rustic-chic. 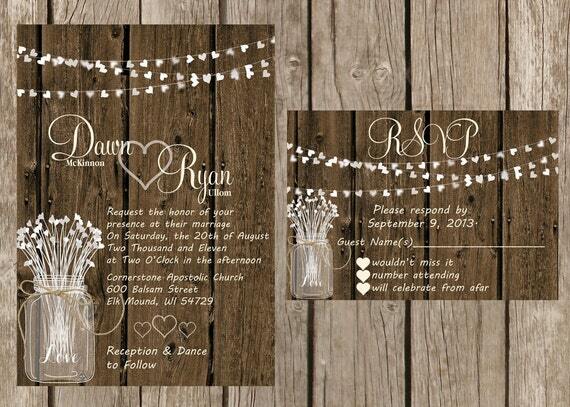 These invitations from Etsy would be perfect for a wedding with the same theme! I love that these come with RSVP cards, which we ended up not doing because I didn't want to fork over the extra cash for them! These come in at $1.45 a piece, which isn't bad for having something hand made just for you. Also, I love the idea of ordering through Etsy because it means I'm helping feed someone's family and not just supporting another corporation. I know what you're thinking, Wal-Mart for your wedding invitations? But y'all-are these not very Kate-Spade inspired?! I was shocked at how many pretty options they have, great font choices, and even different paper choices! Plus, this style is only $0.99 per invite! Once again, this is blurry here-but if you click on the link above you can see it without the blurriness! 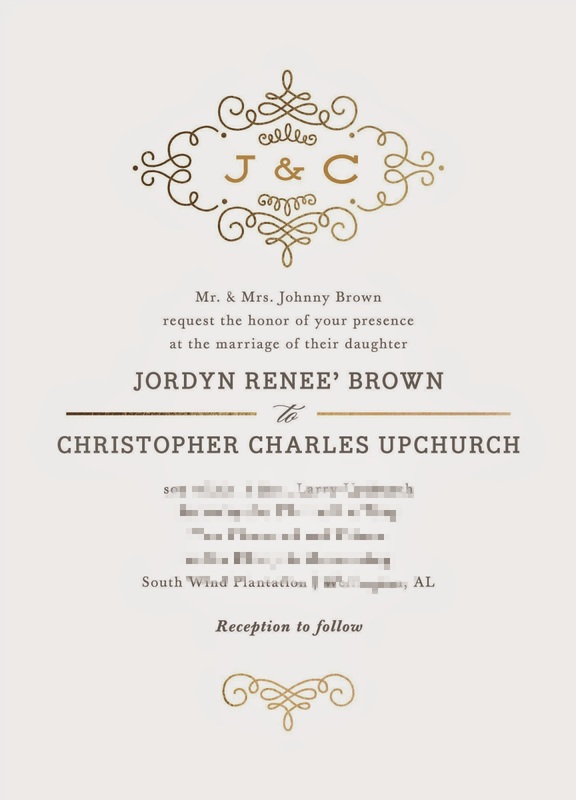 This was actually a high contender for our wedding invites, I love the florals and the gold foil on the letters. These come in at $2.60 per invite, which is a really good deal in my opinion! I've linked them above so you can see the samples and all that, but above is our actual invite! They were actually about $2.40 per invite because we ordered over 100. The reason we chose Minted over all the less expensive options is not only because I just loved this invite-but also because they address all of your envelopes for free! It looked so professional and saved my hands so much pain and suffering. I'm not getting sponsored by Minted in any way, but I just wanted y'all to know about it-future brides, it will save you so much time! I hope y'all enjoyed this little Wedding Belles post! Several people have asked if I will continue doing Wedding Belles after we get married (in 17 days!) and I have decided that I will. If you would like me to continue, please let me know! I hope they do, I know I love them! I love these invites! I'm far from ever getting married, but I always love looking at how brides put together the wedding. The invitations are my favorite because of how adorable they turn out! Planning a wedding has been so much fun :) I hope when your time does come to plan yours, you'll stop by and steal some ideas from The Southern Stylista! Thanks for the wedding invitation ideas! I am also planning currently for June 2016! Such beautiful wedding invitation inspiration! All of these invites are gorgeous! Walmart actually has some good options. Love the ones you chose in the end! I'm so glad you're still looking forward to them! And I'm telling you-Minted is where it's at! So fun, love all your picks!!! Minted!! obsessed with those invites!! They are seriously the best site to order from! Your invites are so pretty! We ended up making our own because I couldn't find what I wanted for an affordable price. These are all so cute!! So in love with the etsy and first minted ones! 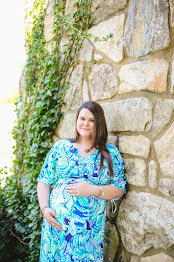 I'm crazy about those other ones from minted, the floral detail is gorgeous! Oooh- thanks for sharing this! I love the invitation you guys chose! Love this post! The ones from Walmart are actually my favorite. They definitely do remind me of Kate Spade. That's great that they address your envelopes! My husbands mom has amazing handwriting so she did all of ours -- it was so nice of her! We ended up making our own invitations to save money but there are so many pretty options out there! I wish I had someone in my family who could do calligraphy, that would've saved us tons of money! I love the last one and the chalkboard one!! So many good options! The chalkboard one is so adorable, I loved it! These are all seriously so cute! I love everything I find on Etsy! I'm with you-I love Etsy, I always find the cutest stuff on there! Oh my, only 17 days left?! How exciting! Great post, I love many of your picks, yours is gorgeous and I also love the one from Etsy for a rustic wedding. I have had my eyes on the minted wedding invites recently hahaha, they are just too adorable. But I really love all the picks. I think my absolutely favorite out of them is the chalkboard one! I love Minted, they are such a great company! So exciting! Great invitation picks. I have to admit, like every bride and groom - my husband and I were so busy that night, we didn't get a chance to eat! But I did hear from my family and friends that the food and service was great! All in all, banquet halls in Miami are a great place to have your wedding reception!